In most companies there’s little or no training and there’s rarely mandatory training. Some managers even view training as an interference with “work” to be done. If you take the time to sharpen your skills, tools and resources, you will be more productive. The most important thing you can do is to insist upon mandatory and regular skills training. 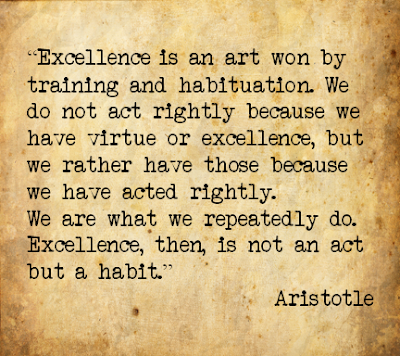 Insisting on excellence alone, is not enough. Information being passed from person to person by word of mouth is a subpar method of training. When you are delivering information with no formal methodology, no classroom-style training, no training manuals, no role playing - you are not setting standards. Again, be realistic. Simply having grand expectations is not setting a standard for excellence. Equip your staff to do great, make your standards clear through action and follow-through. Training programs with policies and procedures, where a new employee learns their job to the extent that s/he can spot when a current employee needs a refresher - that's setting a standard. However, the training shouldn’t stop there. Improving and advancing the skills and professionalism of every person in your company is an ongoing process, and formal training sessions should be regular and nonnegotiable. With training, everyone sings in harmony. What kind of music is your organization creating? If you don’t train, you can’t expect people to get to the next level. That’s why most companies stay small, or have to continually waste time addressing the same issues and problems over and over again. Quality training is guaranteed to show results in your staff and in your bottom line. Your employees know what to do, and can handle any situation with ease, because it has been covered in your weekly sessions together. They are more enthusiastic about their work because they see a real investment in their professional development. When clients experience consistent top-notch service no matter who they are dealing with in your organization, they will keep coming back. Training also saves money because it reduces employee turnover. When employees know exactly what to do in any situation, they have the tools to thrive in your organization. Training boosts confidence and reduces stress. Training is proactive. It keeps your company healthy and prepared no matter what crisis arises. If you don’t train, you force everyone to be reactive, so your chances for survival decrease dramatically. Do not have your team making it up as they go along or when confronted with a crisis situation. Everyone in your team should know what to do in every situation because it is addressed weekly. Repetition is the key to programming your company or department to run like a machine. How are you going to animate your whole team with the same spirit? Three words: training, training and training. When you get all of your people speaking the same language and following standardized procedures, internal communication improves dramatically because everyone shares a deep and rich pool of the same knowledge base.